Oslo, Norway (CNN) -- Anders Behring Breivik, who admits killing 77 people in Norway last summer, gave chilling details at his trial Friday of the gun rampage in which he systematically shot dead scores of young people. Without apparent emotion, he recounted firing more bullets into teenagers who were injured and so couldn't escape, killing those who tried to "play dead" and driving others into the sea to drown. Some survivors and relatives of victims in the courtroom wept as they listened to his detailed account of the attack on a youth camp on Utoya Island in which 69 people died. Breivik is on trial on charges of voluntary homicide and committing acts of terror in the July 22 attacks. He admits carrying out the Utoya attack and a bombing in Oslo that killed eight people. He boasts of being an ultranationalist who killed his victims to fight multiculturalism in Norway. Breivik told the court he had made use of lessons learned from al Qaeda in planning his attacks, and was inspired by the Oklahoma City and World Trade Center bombings. He said one other person knew of his planned attacks, but did not say who that was. Breivik recounted how he had arrived on Utoya Island by ferry, posing as a police officer and telling security officers on the island he was there to talk to them about the bomb attack. He told the court he had said to himself, just before he started shooting, "I just don't want to do this." But then, he said, he thought, "It is now or never." He considered for a minute, as "100 voices in his head said don't do it." Then he picked up his gun and started shooting. His first victim was the lone policeman on the island, Breivik said, whom he shot in the back of the head. The second was the manager on the island. Describing a scene of chaos at a cafe on the island, Breivik told how he shot young people who were paralyzed and could not run away in the head. He also tried to drive young people into the chilly waters around the island so he did not have to shoot them all, he said. He was shouting, "You shall all die today, Marxists," to scare people into the water, he said. He then fired at boats that ventured out to try to save some of those in the water, to frighten them away, he said. Breivik repeatedly tried to call a police chief to give himself up, but no senior officer spoke to him or called him back, he told the court. Concluding that the police did not want him to surrender, he decided to carry on shooting until he was shot himself, he said. Near the end of his rampage, he spared the lives of a girl and boy that he thought were obviously younger than 16, Breivik said, telling how the boy had burst into tears. Asked why he had aimed at the head in so many cases, he said it was "natural" when "the goal is to kill." The first two killings were the hardest, he said. "I knew it was wrong. Taking life is the most extreme action you can do." Breivik insists the deaths were justified by his mission but told the court he was in a "fight or flight" mode that meant the normal "ethical checks" in his brain seemed to have switched off. A grim silence, broken only by sobs, filled the courtroom as those present heard his account, some of it in militaristic language. Breivik earlier said he picked up the idea of wearing a police uniform for the gun massacre on Utoya Island from reading al Qaeda's online "magazine" for followers. He followed al Qaeda closely from 2006 to 2011 and studied the terror network's "media effect, what they have done wrong, what they have done right ... what it takes," Breivik said. He told the court he had gained tips from watching documentaries on the conflicts in Iraq and Afghanistan. Breivik also described how he had taught himself to switch off his emotions as prosecutors quizzed him on whether he felt empathy for others. "You ask if I have empathy and emotion. ... You could say I was pretty normal until 2006 when I started training ... desensitizing myself through meditation," Breivik said. "It's about atrocity, barbaric acts. I cannot even fathom what it must sound to others. I have tried to distance myself from it," he said, speaking of his own actions. 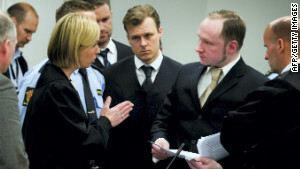 Prosecutors sought to uncover the roots of Breivik's ideas in earlier questioning Friday. Breivik told the court the issue at stake was freedom of speech, and how nationalists "have been excluded since the Second World War." He was driven to violence after trying unsuccessfully to get his views on multiculturalism heard, he said. "I had tried all peaceful means. I have personally found that this was futile. I tried to engage myself politically ... write essays and get through to the editors. ... Then there was only one possibility, that was violence," Breivik said. Asked if he considered his terror attacks to be cowardly, Brevik said it would probably have been "most honorable" to challenge Norway's military to a duel. "But when you are up against a massive strength, one is forced to do asymmetric warfare, and the only thing you have then is the element of surprise," he said. His attorney, Geir Lippestad, had warned that Friday's testimony, with its focus on the Utoya killings, was likely to be "the toughest day." Breivik told the court Thursday that he decided to carry out the gun attack on a Labour Party youth camp on Utoya after his initial plan to target a journalists' conference did not work out. He also hoped to kill former Prime Minister Gro Harlem Brundtland and decapitate her with a knife or bayonet, he said. He planned to film the murder on his iPhone and upload the video to the Internet, he said. 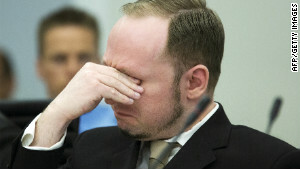 Breivik used the video game "Modern Warfare 2" as training for his shooting, he testified. Players of the game, one of the "Call of Duty" series, work together as soldiers to shoot opponents. He also went through a period of playing the online fantasy game "World of Warcraft" up to 16 hours a day, he testified. 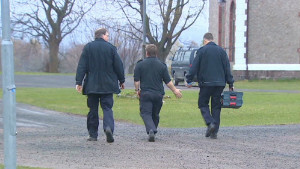 The trial is expected to last up to 10 weeks. Breivik's testimony, which is not being broadcast due to a court ruling, follows his declaration Monday that he carried out the massacre but was not guilty because the killings had been "necessary." Breivik said in court Wednesday that he should either get the death penalty or be acquitted, ridiculing the idea that he would be sent to prison or a mental hospital for his actions. Norway does not have the death penalty. He boasted Tuesday that he had carried out "the most sophisticated and spectacular political attack in Europe since World War II" when he went on his gun-and-bomb rampage. Lippestad said it was important to his client that people see him as sane. Experts have given different opinions about Breivik's sanity, which will be a factor in determining what punishment he receives if convicted. Sentencing options could include imprisonment or confining him to a mental facility. Most of the victims' relatives did not want Breivik's remarks televised, and presiding Judge Wenche Elizabeth Arntzen rejected Breivik's claim that airing it was a human right. Court papers indicated the five judges hearing the case did not want the trial to become a platform for Breivik to air his political views, or for them to distract from the legal issues involved. Breivik has said his rampage was meant to save Norway from being taken over by multicultural forces and to prevent ethnic cleansing of Norwegians. In a 1,500-page manifesto attributed to him, Breivik railed against Muslim immigration and European liberalism -- including the ruling Labour Party, which he said was allowing the "Islamification of Europe." My opinion? I don't quite understand him, because he made himself virtually inhumane - not irrationale, but not fully logical anymore because detaching the human aspect of thinking makes thinking go awry. I feel that, following his lines of thoughts, 1) he has become blinded, 2) innocent people are "casulties of wars to be expected", or 3) I don't know. I am not for violence, and most certainly not for taking lives. Look - what the heck did that policeman or manager do? I simply can't understand his actions. Can someone enlighten me what the meaning of nationalist is? And what does the youth Labour Party have to do with this? If this question sounds stupid, forgive me, but I am quite clueless right now. I find it very ironic that he was against the immigration of Muslims, but uses knowledge and information from al Qaeda to essentially pull this off. In the part dealing with the frustration. He had much better options than this. He could have moved to an area that was more secluded with less immigration, among other options. Agree with his message, disagree with his actions. Guy is nuts. I hope they don't kill him. He deserves to be in solitary confiment the rest of his life. This kind of people who hates on immigrants like this, they are just crazy. How the hell can any sane person agree with this man's message. @above he needs to die you can't just spend the rest of your life in a person cell after killing that many people. If he was willing to kill then he should be prepared to be killed. Because his message and his actions are two very very different things. where is his death sentence ? @hadriel; IIRC, the massacre occurred during a youth labor party retreat. Many European nations (particularly Scandinavian ones?) have a Middle Eastern immigration "problem" because the immigrants effectively construct their own isolated communities and do little if anything to adopt the culture of their new nations. I'm taking an educated guess that "nationalists" refer to those that reflect traditional Norwegian values and culture as opposed to immigrants that continue the practices of their original countries. Norway doesn't have a death penalty. Note: I am not Norwegian and this is just what I've heard/read. IMO, this pineappleer needs to rot in solitary prison for a long, long time. That's worse than death for me. My only worry is that his defense lawyer might get away with some sort of insanity plea. We do not have death penalties in scandinavia and the rest of europe. And i actually hope he's gonna be declared insane, no psychiatrists will ever sign that he's sane so that's a permanent lock-up. will there be any difference to his sentence if he's declared insane ? ...he's way too nuts. Killing for that reson is just...what. "Breivik used the video game "Modern Warfare 2" as training for his shooting, he testified." It's already been emphasized on some news articles out there I believe. Media exaggeration here we come once again. He might have made that up to make Al Qaeda the villain. May he rot in prison forever. Conveying a message like this is never the answer and will ultimately not be received because of the cruel way he tried to get it across. I've seen way too many people claiming this. Sure, the first test indicated that he would be irresponsible. However, Breivik claimed that he cheated this test, but later regretted it stating that a diagnosis that he is criminally insane would be �worse than death.". And he was serious. In the next test, he wasn't irresponsible. Personally, I do not want that he will be treated like a patient of somekind. Here in Finland, police didn't imprison a man, because he was found to be irresponsible during the homicide and they set him free claiming that he "had recovered" from the irresponsibility. I'm convinced that Breivik was fully aware of his actions, which is beyond disgusting to think and that's why it may be easy to see him as an animal of some sort. Breivik is an extremist in Nazism and Christian Extremism. Norway tragedy was a well measured, cold and very inhuman political terrorism instead of a berserk and impetuous action that an insane person would make. It was a one man 9/11. Well... At least I hope he worked alone. I'm still not completely sure about that, simply because HE claims so. And I find it offensive against the victims and their relatives, that this piece of crap is getting the attention he wants. Even if some of the victims said that it works as a therapy for them. This was what i thought. I was pretty mad when people started claiming that he was insane. He is not. He can think perfectly fine, if not, how the hell did he plan it like a 'pro' ? He's just and idiot that went overboard.. like wwaaaayyyy overboard that they should bring him over to asia and give him a death sentence. Killing people and claiming insane to avoid any form of punishments is disgusting. Insane or not, this man should get what he deserves just like any other terrorists out there. Insanity doesn't mean incompetent, he would be claiming it as he can rationalize his actions and can't fathom what he was doing. Although he admits to knowing it was wrong initially, he essentially went off an adrenaline rush once he started. That basically voids anyone who do such acts of punishment because essentially anyone who would even think of doing that is technically insane. To give you an example, it be like your mother killing me for molesting you. In this case it seems like willful intent, which is pretty clear in my eyes though. Are evil and insane the same thing? Not at all. I would say it's kind of impossible to be evil if you're truly insane. Insanity suggests a detachment from normal paths of reasoning. Evil suggests an intent to cause pain. To be evil you must know that the pain you're causing is wrong and enjoy it because of that fact. If you were insane it'd be unlikely that you could reason that your actions were wrong whilst simultaneously enjoying them. Insanity could be the cause for actions which are percieved by the public to be 'evil' but which are in fact not evil because the individual responsible for said actions was either unaware of the consequences or did not intend for them. On the other hand... in an odd way you could argue that insanity is a detachment from norms and so is evilness. What is considered evil by one culture may not be by another, so evil is a relative idea, something is only evil because it's not acceptable inside the culture it's being inflicted upon. Insanity works in the same way: someone is considered insane if the way they think is different to the way everyone else thinks, if everyone else thought the same way as the insane then the insane wouldn't be considered insane even though they're still thinking exactly the same thing. But even then, in a culture where what we consider to be evil is acceptable and where everyone thinks in what we would call an insane way, there would be actions which were deemed evil and thoughts which were considered insane, and they wouldn't be the same thing. So, no, I guess they're not the same thing. Nice question though, got my brain working.